Beautiful digital piano with matching bench. 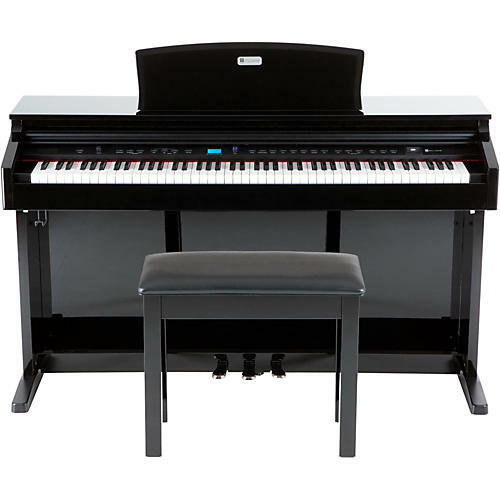 This package includes the Williams Overture 2 digital piano along with a Williams WPB Piano Bench, a comfortable and stylish traditional padded piano bench design. Williams redefines digital piano elegance with the Overture 2, complete with a classic, luxurious ebony gloss finish, a robust sound palette, extraordinary feel and unexpected extras. The Overture 2 is built on 15 quick-to-grab custom-crafted, high-resolution sounds as well as plenty of other instruments from brass to percussion and beyond. The Williams WPB provides hours of comfortable practice and performance for home, stage or studio. This solid wood construction bench with steel reinforcement features a high-gloss finish that is the perfect complement to the Williams Overture 2 or any traditional piano. The fixed-height design supports a natural playing posture, and its generously padded seat makes long sessions remarkably comfortable. Some assembly required. Traditional design, feel and comfort. 12 x 24 x 19.5”, 16 lb. The perfect pair. Order soon.